#13 BU takes on # 10 Michigan in the Northeast Regional Final at the DCU Center in Worcester with puck drop set for 4 p.m. ET. The game airs live on ESPN2. The Terriers, who lost last year’s Western Regional final to Minnesota-Duluth in overtime, will be trying to overcome that same hurdle and advance to the Frozen Four for the first time since 2015. Michigan earned its spot in today’s Regional final with a 3-2 win against Northeastern, led by a pair of Cooper Marody goals. The #4 seed Terriers and #2 seed Wolverines will be meeting for the ninth time in the NCAA tournament, with each team having won four times. 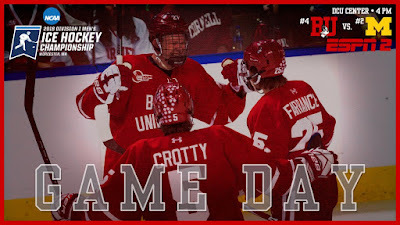 Their last meeting was in 1997 when the Terriers upset top ranked and defending champion Michigan, 3-2 (video), in the Frozen Four semifinal. With Northeastern’s loss and Providence dropping a heart-breaker to Notre Dame, BU is the sole Hockey East team remaining in the tournament. Five teams from USCHO’s pre-season top 20 are still alive: #1 Denver, #2 BU, #6 Minnesota Duluth, #8 Notre Dame and #19 Ohio State. 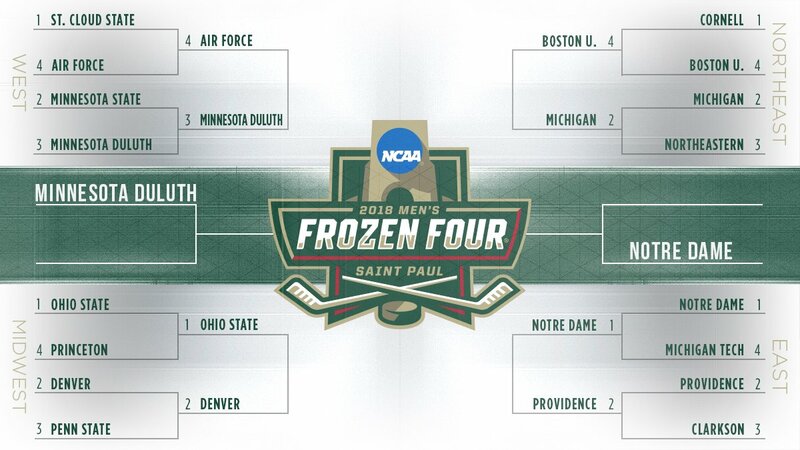 Notre Dame and UMD have earned spots in the Frozen Four. Denver vs. Ohio State will decide the final spot. Take a look at 2019 recruit Joel Farabee's hard work to set up one of Jake Wise’s two goals in last night’s win against Chicago. Sweet pass, sweet shot, sweet sweaters.